Ariocarpus bravoanus LRM159, flowering in habitat during October. Ariocarpus bravoanus LRM159, clearly showing the tubercle structure of the species. 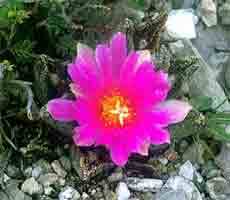 Ariocarpus bravoanus LRM159, in the October flowering season. 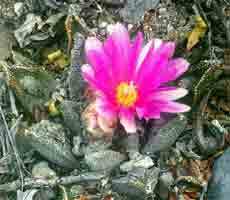 The most recently discovered member of the genus, Ariocarpus bravoanus is extremely limited in its distribution, and the population has been greatly depleted by collection, Efforts are now being made to protect the remaining plants. 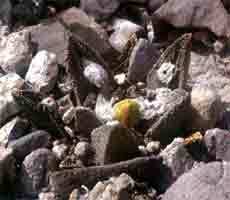 however its survival is precarious, for a single collector could decimate the remaining plants within a couple of hours.